You may not have heard of Timor-Leste, one of the world’s smallest, newest countries, which occupies half of an island north of Australia. But a Catholic Relief Services project is making an important impact on nutrition there by supporting families in growing healthful vegetables to add to their largely rice-based diets. Agostinha Dionisia da Costa, a mother of six, remembers when diets included more than just rice. “When I was a child, people gave their children taro, sweet potato and cassava,” she says. But poverty forced families to start selling the nutritious foods they had grown. They began eating only white rice. “That’s what we must change to have healthy children,” Agostinha says. Timor-Leste has one of the world’s highest rates of stunting among children under age 5. Caused by malnutrition, the condition inhibits physical and mental development and can lead to a lifetime of problems. People here are at high risk for malnutrition because of poverty caused by years of civil war prior to the country’s independence in 2002. Changing weather patterns are worsening the problem. 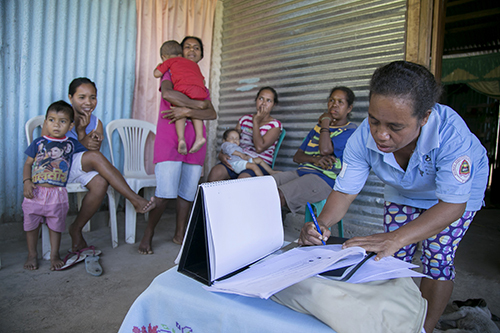 Agostinha, who lives with her family in a tiny mountain village called Afalari, works with pregnant and nursing women in a community-driven project to improve nutrition. 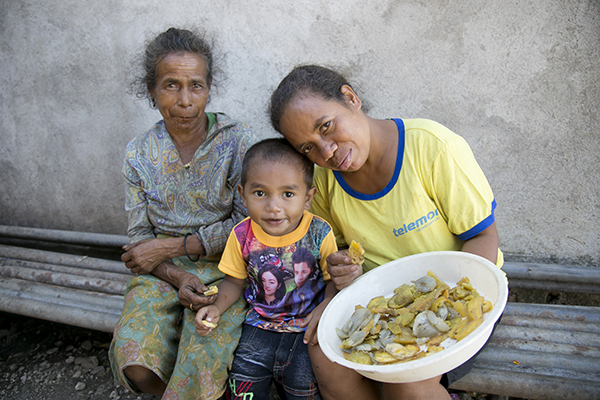 The CRS program, supported by the World Bank, teaches the women ways to improve their families’ diets. They learn how to grow nutrient-rich vegetables to pair with the rice and corn that are staples of family meals. “Good food—with vitamins from vegetables and protein from beans—means that our children will grow strong and their brains can develop well,” Agostinha says. Without nutritious foods like these, children don’t get the vitamins needed at critical stages of development. CRS helps parents incorporate beans and a new variety of sweet potato to boost three key nutrients—vitamin A, protein and iron—in children’s diets. Agostinha not only explains the importance of incorporating vitamin- and protein-rich foods into rice-based meals, she also helps mothers and caregivers learn how to cook them. Combining the cooking lessons with storytelling from her own experience, she powerfully illustrates the importance of good nutrition for healthy pregnancies and children. “If I only give information, the women will not listen,” she says. “But if I tell of my experience, they will listen and remember. For example, my 7-year-old son was born with a disability. Even now, he is very small for his age. I describe how I am changing his food to make him strong. Now he is eating more than only rice. Although she says she still struggles to cook beans so they are soft but not overcooked, her husband, Celestino, compliments her new skills in the kitchen.